• Great news from Australia: Sydney University has frozen investment in coal. This misses the fundamental reality that while we are all embedded in the carbon economy to some degree, it is not really by choice. Do we choose to buy a particular car because it is powered by gasoline? Does anyone (other than a fossil-fuel company) care about the source of the electricity that powers our appliances? No. The real hypocrisy is saying that you support a world largely free of fossil-fuel emissions, while at the same time betting on their producers to continue delivering a steady profit stream to your endowment. • It’s well worth reading the logic of Stanford University’s coal divestment decision. Stanford’s Statement on Investment Responsibility, originally adopted in 1971, states that the trustees’ primary obligation in investing endowment assets is to maximize the financial return of those assets to support the university. In addition, it states that when the trustees judge that “corporate policies or practices create substantial social injury,” they may include this factor in their investment decisions. Today, UC Berkeley and most institutions are financially invested in destroying our future… Instead of funding the problem, we should be investing in solutions that at once aid the transition to a low-carbon economy and grow our university’s bottom line. There is no lack of financially and environmentally sustainable reinvestment opportunities; as of yet, there is only a lack of leadership. Our scientific papers, public presentations, and advice to policymakers have not spoken loudly enough. For better or worse, we need to “put our money where our mouth is.” And we can do this in two ways: First, by becoming carbon neutral and, second, by simultaneously stopping our investment in the ongoing extraction of fossil fuels. Although some financial sacrifice in pursuit of our institutional responsibility would be justified, we have conducted the analyses and determined that the proposed actions will not only have a negligible impact on growth of the University’s endowment, they may significantly reduce overall risk in the University’s investment portfolio. Our students have led the way. It is time for the faculty to step up to the plate. Our goal is to make a strong public statement that will draw attention to the need for society to transition from fossil fuels to truly clean sources of energy that are fossil carbon neutral. We recognize that the University’s divestment actions can result in only a relatively small direct financial impact on these companies. However, the moral courage demonstrated first by Cornell, and then by its peer institutions, will have a galvanizing effect on the movement within this country and internationally. 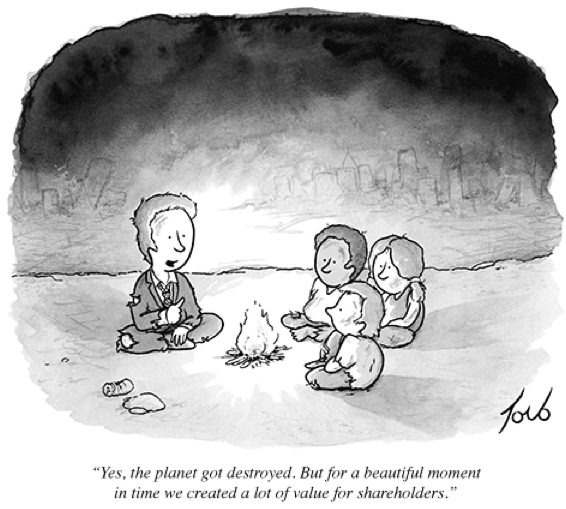 • On the other hand, Oregon State University has rejected divestment calls, with the excuse that “categorically removing this sector would violate prudent investing rules that characterise best practices in asset allocation.” To which, the best response may be this cartoon.